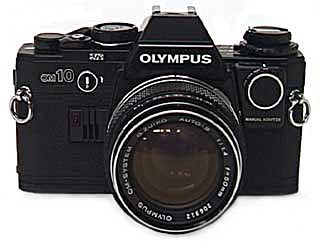 Olympus OM-10 was launched in 1979 which was the same year as the OM-2N came on the market. Although it was a popular model, TTL metering was enabled on the camera since it employed photocell located at the bottom of mirror chamber. On the OM-10, only aperture-priority AE was available, and for that reason, the manual-exposure adapter for it was provided as an option. There was only one dial on this adapter, but it made it possble to set shutter speeds 1 sec. to 1/1000 sec. First introduced in June, 1979. Body weight : 430 g.